Sunrise Apartments, located in St. Peters, is a complex of studios and apartments nestled opposite a lovely beautiful sandy beach with crystal, warm waters. This is a family friendly self-catering hotel is in a strategic location within a short walk of the town centre and other tourist attractions. Featuring a large swimming pool, sun terrace and snack bar, the hotel welcomes guests to experience a stay in comfort and tranquility in the lively resort of Kavos. Furnished guest rooms offering amazing views of the sea and surroundings feature climate control, television and a refrigerator. The hotel is located on the pretty St Peter’s beach which has fine sands and clear waters. The beach is barely 300m from the property. This is the longest beach on the island stretching along for more than 1km. However, being a good 15 minutes’ walk from Kavos means it is also free from the touristy crowds and offers a secluded recluse. The beach offers a vantage point on the sand, where visitors can see ships coming in and leaving the Gaviro Harbour. Few of the lush islands are visible in the background too. With golden sands beach and crystal-clear waters, this is a top favourite of holiday makers to soak up the sun. There are lovely cafes and a fine beach bar that dot the shore, making it a delightful beach to relax in. Elina is situated around 18km away. The hotel is located 29km from the Ioannis Kapodistrias Airport. Immaculate, well-appointed rooms Sunrise Apartments feature a private and fully furnished balcony from where there are magnificent views of the sea and the surroundings. 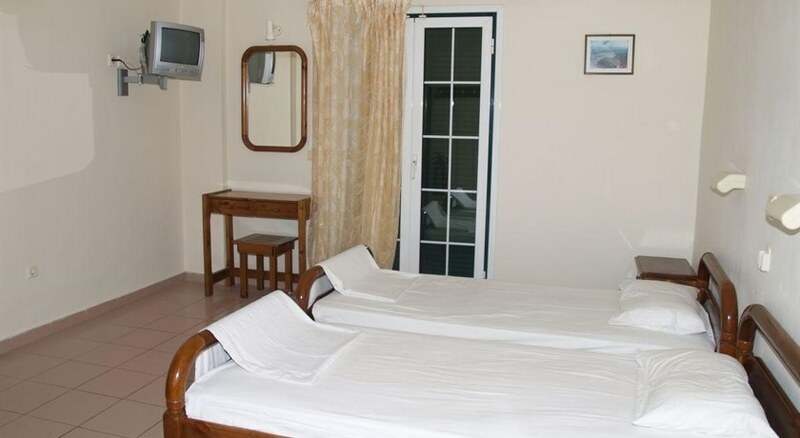 The rooms come furnished with air conditioning (chargeable), iron and ironing board, hair dryer, satellite TV and a well-equipped kitchenette with fridge and cooking rings. These also have en-suite private bathrooms with shower and WC. The hotel offers Wi-Fi hotspots, currency exchange and safe deposit facility. Sunrise Apartments are self-catering and come with a well-equipped kitchenette with fridge and cooking rings to enable guests to cook their own food. It has a snack bar serving delicious light bites and alcoholic and non-alcoholic beverages like tea and coffee. 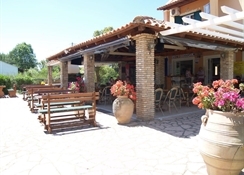 Guests can order traditional Greek dishes as well as international cuisine, snacks and light meals here. There are good dining options nearby. The snack bar serves alcoholic and non-alcoholic drinks. Sunrise Apartments has a swimming pool and terrace decked up with loungers and parasols. There is Yoga classes and a fully equipped gym for those who wish to stay active. There is a lovely spa with steam room offering massages and therapies. Tiny tots can have fun at Kid’s Club or Playground. The hotel has a Games Room and a Snacks Bar. Guests can also shop at the shops on-site. There is lively evening entertainment and a nightclub too. Great apartments on the beach lovely family run place that would do anything to help. We are definitely going back. Fantastic place to stay run by genuine nice people will definitely return.